On one hand, networks affect the well-being of the people and the smooth functioning of services and, more generally, of economical activities. Even if Agglo of Orleans is focusing on vulnerability assessment, methods and tools to assess it are very poor actually, especially concerning network vulnerability. On the other hand, River Loire is surrounded by old dikes that have to be assessed in term of performance. In the same time, dike managers need to prioritize their actions in a context of security increase, annual budget limits and poorly documented levee. Thanks to this work, it is possible to establish efficient flood risk management concerning the protection of critical urban spots and then to improve teh capacity of a city to recover from disturbances. This work will be implemented in collaboration with the DREAL centre which managed the dikes surrounding the river Loire. Agglo of Orleans is also looking for accurate geographical knowledge of their dikes. Thus, LIDAR mapping of Loire levees (upstream to downstream of Orléans) and geophysical methods will be achieved in FloodProBE project. 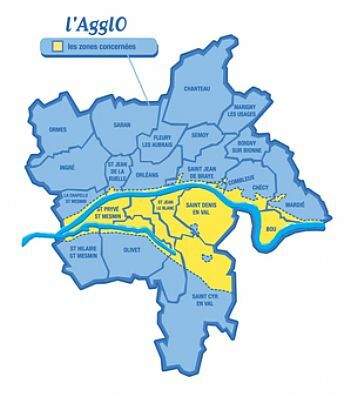 In order to assess networks vulnerability, Agglo of Orleans is a partner in the development of a specific GIS tool. The objective is to develop a methodology for producing interdependent networks disturbance scenarios in order to indentify the most critical components. Software is currently under development to take advantage of this methodology. This software is the first step toward a GIS tool taking into account of network interdependencies and allowing geolocation of critical components. The combination of dike vulnerability assessment and networks vulnerability identification is an interesting perspective for the Orleans pilot.